Supramolecular solvents (SUPRASs) are nanostructured liquids produced by the self-assembly of amphiphiles at the molecular, nano and micro scale that offer excellent opportunities to be tailored through the bottom-up approach. They have a great potential for the setting-up of generalized sample treatments and multiresidue analysis due to their multi-binding capacity and tunability. Efficient extraction schemes can be developed thanks to the variety of interactions (dispersive, ionic, polar, etc.) they offer for solute solubilization. SUPRASs are simply synthesized by spontaneous processes and are considered as green alternatives to typical organic solvents (low toxicity, flammability, etc.). This review highlights those theoretical and practical aspects related to the synthesis and application of SUPRASs on which one should focus to exploit their benefits for the setting-up of efficient and reliable analytical schemes. It aims to provide a practical guide for SUPRAS selection and optimization in the analysis of organics by liquid chromatography (LC) separation and common LC detectors. Theoretical and operational aspects of SUPRAS are discussed with the aim of providing fundamental knowledge to potential users and facilitate implementation of SUPRAS-based methods in laboratories. Although the appealing power of self-assembly to give tailored SUPRASs remains largely unexplored, advances and opportunities regarding tailored SUPRAS are highlighted. Coacervation, the phenomenon through which liquid–liquid phase separation is produced in a colloidal solution of amphiphiles by self-assembly processes, is an outstanding way to produce tailored nanostructured liquids with impressive characteristics for improving yields, selectivity, sustainability and economics in analytical and industrial processes . The interest for the application of these liquid phases in analytical extractions has progressively increased since Watanabe et al. first proposed the temperature-induced coacervation of non-ionic surfactants (cloud point technique, CPT) for the extraction of inorganic ions. The research of Hinze et al. greatly boosted analytical applications by providing the theoretical background for understanding surfactant-mediated phase separations. Since then, hundreds of applications involving the extraction of a variety of inorganics and organics from both liquid and solid samples (environmental, biological, food, pharmaceutical, agricultural, etc.) have been reported [4, 5, 6, 7, 8, 9, 10]. 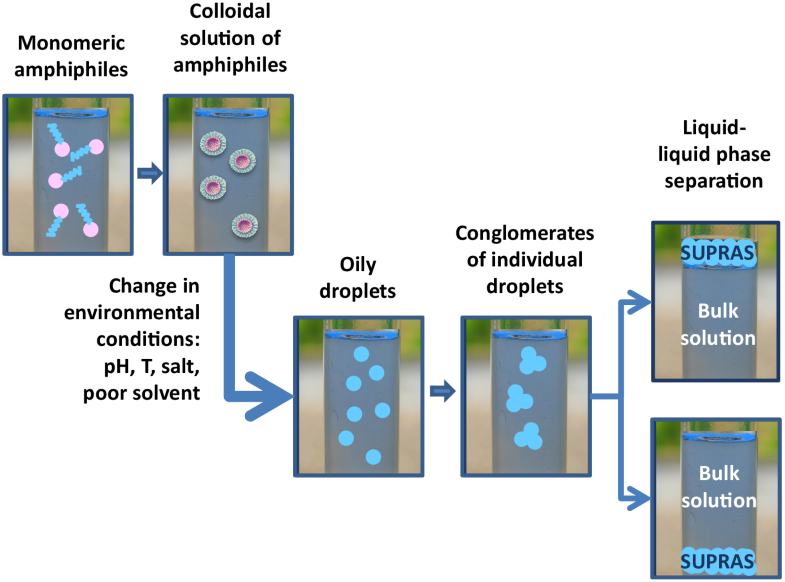 Despite the advances on coacervation-based analytical applications, there is still a poor knowledge on the structures of these colloid-rich liquid phases. Furthermore, the use of trial and error synthetic procedures is common and the potential of coacervation to produce tailored solvents has been hardly exploited yet. In the scientific literature on coacervation in the colloid, polymer and physical chemical fields, some attention has been paid to the elucidation of the structure and behavior of colloid-rich phases. However, the different names coined in these fields for coacervates (e.g., L3 phase, anomalous phase, sponge phase, blue I phase, plumber´s nightmare, etc. ) has made difficult the systematization of knowledge within this area. In analytical chemistry, the more usual names have been cloud point technique, to refer to the temperature at which non-ionic surfactants start undergoing phase separation and coacervate to refer to the phenomenon through which the liquid–liquid phase separation takes place. In this context, we proposed some years ago the term supramolecular solvent, SUPRAS  to highlight the differences between these liquid phases and molecular and ionic solvents, to underline the non-covalent interactions through which molecules form nanostructures and to emphasize the self-assembly process through which they are synthesized. SUPRASs have unique properties for the development of innovative extraction processes, mainly arising from the intrinsic characteristics of the amphiphiles making up them. Amphiphiles self-assemble spontaneously to give nanostructured liquids where the structure and properties of the supramolecular aggregates can be tailored by proper selection of the amphiphile and the environment for coacervation. Amphiphiles in the SUPRAS are held together through non-covalent interactions, therefore, the nanostructures are reversible and environment-responsive and this opens the door to the synthesis of solvents that can be programmed to meet specific properties and exert predetermined functions. In this respect, SUPRAS featuring restricted access properties, able to extract low molecular weight solutes while excluding macromolecules, have been recently reported . Efficient extractions can be obtained using SUPRASs as extractants owing to the different polarity regions present in the supramolecular aggregates that offer mixed-mechanisms for their solubilization. As a result, solutes in a wide polarity range can be simultaneously and efficiently extracted. On the other hand, SUPRASs contain high concentration of amphiphiles, which makes them ideal platforms for amplification of solute binding. Thus, high extraction efficiencies can be achieved using low volumes of SUPRASs, which results in high concentration factors (typically 100–500). Sustainable and economical SUPRAS-based extraction processes can be developed on the basis of the energyless synthetic procedures through which they are obtained and the number of green natural amphiphiles commercially available at low cost. All these characteristics make SUPRAS easily accessible and ideal for implementing safer processes. 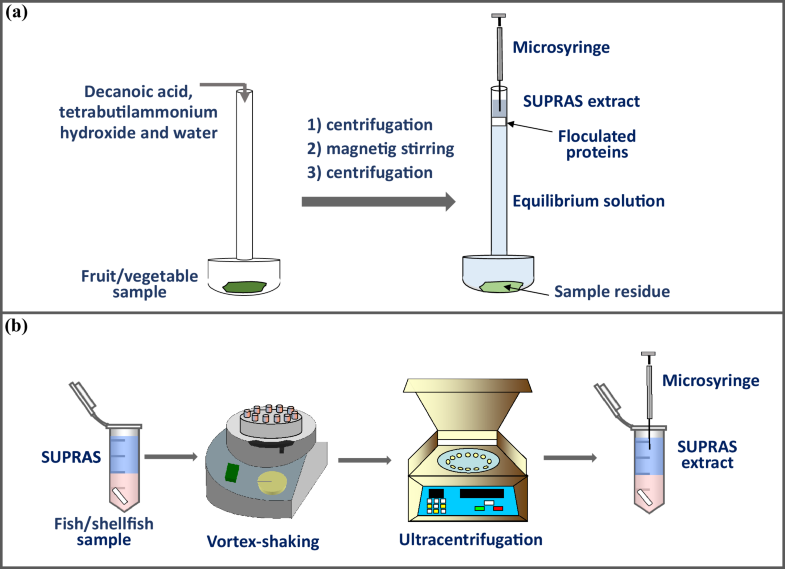 This review discusses SUPRASs features and gives tips to design SUPRASs that meet the analytical and operational requirements for the development of efficient and reliable methods based on the combination of SUPRAS sample treatment and LC determination of organics. The general procedure for the synthesis of SUPRAS is quite simple and consists of two steps (Fig. 1). First, an aqueous or organic colloidal solution of the amphiphile is prepared above the critical aggregation concentration (cac). This solution contains supramolecular aggregates, typically aqueous or reverse micelles or vesicles. The morphology of these aggregates mainly depends on the structure of the amphiphile, the nature of the solvent, the environmental conditions, and the relative size of the head group and hydrocarbon chain of the amphiphile. Second, coacervation is induced by increasing the size of the supramolecular aggregates. Major inductors of coacervation are pH, temperature, inorganic and organic salts and poor solvents for the amphiphile. Under the action of inductor agents, oily droplets are formed that associate in clusters of individual droplets. The density of these conglomerates is different from that of the solution in which they formed, that facilitating their creaming and separation as a new liquid phase, named coacervate or SUPRAS (Fig. 1). This liquid phase is very rich in amphiphile (typically 0.1–1 mg µL−1) and it is in equilibrium with the bulk solution that contains the amphiphile at the cac. The oily droplets keep as individual entities in the SUPRAS, so these solvents have intrinsically a high superficial area thus facilitating solute mass transfer in extraction processes. Self-assembly of amphiphiles at any level (molecular, nano, micro) is a reversible start–stop process that occurs through a balance of attractive and repulsive interactions and a delicate interplay between amphiphile–solvent and amphiphile–amphiphile interactions. For typical amphiphiles, solvophobicity drives aggregation while the stop process emanates from head group–head group repulsion . The ordered structures in the supramolecular aggregates are hold together by non-covalent interactions (e.g., ion–ion, ion–dipole, dipole–dipole, hydrogen bonding, cation–π, π–π, dispersion), which are considerably weaker (2–300 kJ mol−1) than covalent interactions (150–450 kJ mol−1). However, very stable supramolecular assemblies can be formed since several interactions, working usually in a cooperative manner, are established simultaneously . Reversibility or adjustability is a key factor for generating ordered structures by self-assembly and understanding the behavior of SUPRASs in solution. If conditions of the equilibrium bulk solution (Fig. 1) change, the aggregates will be reformed and indistinguishable from the original, so they behave as adaptive materials . The reversible nature of SUPRASs offers a simple way to manipulate the ordered structures that make up them and opens the door to the design of tailored solvents. However, the implications of the reversibility of supramolecular aggregates should be thoroughly considered for the development and optimization of extraction processes. Because formation of SUPRAS from colloidal solution of amphiphiles always involves the increase of the size of the supramolecular aggregates, inductors of coacervation should reduce the head group–head group repulsions that stopped aggregation in the colloidal solution. How to achieve coacervation mainly depends on the nature of the amphiphile-solvent making up the colloidal solution . As a general rule, the free energy cost of bringing the polar heads together is much smaller for neutral than for ionic amphiphiles . Regarding nonionic amphiphiles, the most effective way to promote coacervation is to lower the number of solvent molecules available for solvation, which can be achieved by modifying the temperature in amphiphile-aqueous systems or by adding a poor solvent for the colloidal aggregate in amphiphile-organic systems. Coacervation of ionic amphiphiles always requires the neutralization of the charge by addition of inorganic or organic salts or amphiphilic counterions. On the other hand, ionizable amphiphiles can be considered as nonionic or ionic depending on the pH of the solution. In addition to the above respective strategies, coacervation of ionizable amphiphiles can be achieved in acid media, at acid concentrations in excess that required for their neutralization. SUPRASs are commonly made up of amphiphiles, water and, where appropriate, coacervation-inducing agent and/or other additives. The possibility of reforming the aggregates in the SUPRAS as a function of the environmental conditions in the equilibrium bulk solution (Fig. 1) offers a great opportunity for tailoring SUPRAS composition and structure. Also tailoring is possible by proper selection of the structure of the amphiphile . As a general rule, the concentration of amphiphiles in the SUPRAS (CSUPRAS) gradually decreases as the length of their hydrocarbon chains increases and it keeps constant for increasing concentrations of amphiphile in the colloidal solution provided that the composition of the bulk solution maintain invariable. Temperature-induced coacervation has been the usual way to produce SUPRAS from aqueous colloidal solutions of non-ionic (e.g., alkyl and alkylphenol ethoxylated), zwitterionic (e.g., alkyl betaine) and mixtures of non-ionic and non-ionic/ionic amphiphiles. The temperature at which colloidal solutions become turbid and amphiphile aggregates undergo coacervation is named cloud point (CP). It depends on the structure and concentration of the amphiphile as well as on the presence and concentration of inorganic and organic additives in the colloidal solution. The mechanism through which nonionic amphiphiles produce SUPRAS above the CP temperature is the removal of some hydration water from their polar groups which causes two effects, namely, the area per head group is reduced and the head group regions of two aggregates overlap thus providing a mechanism for attractive aggregate–aggregate interaction. Unlike nonionic surfactants, zwitterionic amphiphiles assemble into SUPRAS as the temperature decreases below a critical value. This behavior has been explained on the basis that electrostatic interactions between zwitterionic surfactants are of short range and their effects are quite different from those of ionic amphiphiles. CSUPRAS can be tailored by modifying the temperature set for coacervation and the presence of additives. Thus, for ethoxylated amphiphiles, it is possible to increment CSUPRAS, due to the reduction in their water content, by increasing the difference between the temperature set for coacervation and the cloud point (∆CPT = T − CP). Likewise, CSUPRAS can be incremented through the salting-out effect by the addition of some cations (Na+, K+, Rb+, Cs+ and NH4+) and most of the anions. However, many cations and some anions (e.g., SCN− and I−) cause a decrease of CSUPRAS owing to their salting-in effect. The elucidation of the nanostructures of temperature-induced SUPRASs is not a mature issue and not analytical benefits have been reported from the possibility of tailoring them yet. For oxyethylated nonionic surfactants (CnEm), the nanostructures in the SUPRAS depend on the n–m ratio. Thus, spherical-to-rod-like micelle transitions are induced by increasing the temperature for moderate n–m ratios (e.g., C12E5) while spherical aggregates have been observed by increasing the number of oxyethylene groups at a constant alkyl chain length (e.g., for C12E8) since the packing parameter decreases and the spherical shape becomes the preferred one. Solvent-induced coacervation has been shown successful for the synthesis of SUPRAS from nonionic carboxylic acids and alkanols. In this strategy, a poor solvent for the amphiphile is added to the colloidal solution. Both the solvent in the colloidal solution and that used as inductor of coacervation have to be miscible. A variety of solvents have been reported to prepare the colloidal solution (e.g., tetrahydrofuran, ethanol, dioxane, methanol, etc.) while water has been primarily used as inductor agent. The relative proportion of water-organic solvent at which the SUPRAS is produced depends on the dielectric constant of the organic solvent and the hydrocarbon chain of the amphiphile. Water-induced SUPRASs offer excellent opportunities for getting tailored nanostructured solvents . Thus, CSUPRAS for alkanols and alkyl carboxylic acids is highly dependent on the relative proportion of water and organic solvent in the colloidal solution; it gradually decreases as the percentage of organic solvent in the colloidal solution increases. On the other hand, the size of the coacervate droplets that form the SUPRAS (Fig. 2a) and the aqueous cavities of the inverted hexagonal aggregates in which the amphiphile arranges (Fig. 2b) can also be tailored according to the organic solvent:water ratio in the bulk solution. This property has been exploited for the design of restricted access solvents. Interesting applications have been developed for the extraction of low molecular weight solutes while excluding macromolecules by both physical and chemical mechanisms . Counterion-induced coacervation is routinely used for getting SUPRAS from ionic amphiphiles (e.g., alkyltrimethylammonium salts, alkyldihydroxyethylmethylammonium salts, alkylsulphates, carboxylate, etc) by neutralizing their charge. Among counterions, the amphiphilic ones (e.g., tetrabutyl ammonium for anionic amphiphiles) are preferred because of their greater efficiency in reducing ionic head group repulsions compared to inorganic (e.g., chloride, sulphate) or organic (e.g., salicylate, tosylate) counterions. CSUPRAS increases as the concentration of inorganic counterions in the colloidal solution does. Acid-induced coacervation has been the most frequently used way to produce SUPRAS from colloidal solutions of ionizable amphiphiles such as alkyl sulphates, sulfonates and sulfoccinates. Although the concentration of acid required for coacervation (2–3 M HCl) is very high, interesting applications have been developed for extraction of solutes from solid samples. CSUPRAS increases as the concentration of acid in the colloidal solution does. Formation of SUPRAS occurs in a specific range of concentration of amphiphile under the action of an interval of operating conditions for the inductor agent (e.g., temperature, counterion, solvent, acid, etc.). Therefore, the first step in the synthesis of new SUPRAS is to construct the phase diagram and delimit the SUPRAS formation region. Figure 3 shows different phase diagrams for typical amphiphile coacervation-inducing agent systems. Depending on the nature of both the amphiphile and the coacervation-inducing agent, phase diagrams are more or less complex and the region for SUPRAS formation is narrower or broader. In most cases, this region is wide enough for analytical purposes. The presence and concentration of additives in the colloidal solution or modifications in the operating conditions (e.g., temperature, pH, etc.) can influence the boundaries for SUPRAS formation in phase diagrams, which can be exploited for improving experimental extraction conditions. Thus, the value for CP (e.g., Fig. 3a) decreases as the concentration and charge of inorganic ions in the colloidal solution increases. This sometimes allows the production of SUPRAS from aqueous colloidal solution of nonionic amphiphiles at room or near-room temperature. On the other hand, this is an aspect to take into account as SUPRAS are used for extraction of solutes from real samples. Components such as sugars and alcohol in food  can extend or narrow the region for SUPRAS formation. Therefore, it is always recommended to determine phase diagrams for SUPRAS in the presence of the samples from which solutes will be extracted. SUPRASs solubilize analytes establishing multiple solute-amphiphile bonds involving two or more type of intermolecular interactions that work in a cooperative manner. The type of interactions that a SUPRAS provides for the solubilization of organics is mainly determined by the chemical structure of the amphiphile or amphiphiles forming the supramolecular aggregates. Most amphiphiles consist in a hydrocarbon chain and a polar group, therefore, all of them can solubilize solutes through dispersion, dipole–dipole and dipole-induced dipole interactions. 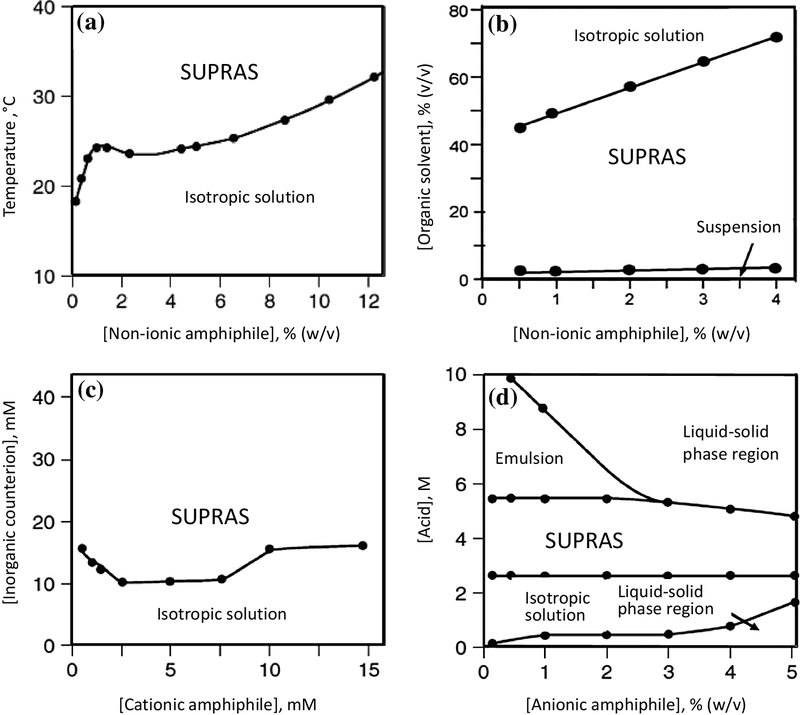 SUPRASs of amphiphiles with charged groups can also establish ion–ion and ion–dipole interactions, and if these groups are cationic, π–cation interactions can also occur. Finally, SUPRASs consisting of amphiphiles with proton donors or acceptors (e.g., –OH, –C=O) can interact with solutes through hydrogen bonds, while those having two lone electron pairs (e.g., N, O, P, S, Cl, Br, I, etc.) can interact through halogen bonds. The strength of interactions decreases in the order ion–ion > ion–dipole > halogen bonding > π–cation > dipole–dipole > dipole-induced dipole > dispersion. Logically, the effectiveness of the extraction increases with the strength of the interactions involved in the solubilization of the solute. Interactions driving extraction of nonpolar organics in SUPRASs include dispersive, dipole–dipole and dipole-induced dipole interactions, and therefore, all SUPRASs have the potential to extract efficiently this type of solutes. Extraction efficiency increases with the hydrophobicity of the organic, therefore, the octanol–water distribution constants can be used as a guide to predict the extraction behavior. Amphiphilic solutes are efficiently extracted through the formation of mixed aggregates with the amphiphile making up the SUPRAS. The strongest interactions occur for ionic amphiphiles that are extracted with SUPRAS with polar groups bearing opposite charge. SUPRASs have been applied to the extraction of a variety of amphiphilic compounds (i.e., cationic  and anionic  surfactants, perfluoroalkyl substances , carotenoids  and pharmaceutical drugs [21, 22]) in both liquid and solid samples. The nature of the polar group of the amphiphile making up the SUPRAS is essential when polar organics are the target. Thus, the anionic microcystin-LR and microcystin-YR are efficiently extracted using SUPRASs of the cationic surfactant Aliquat 336, while their extraction in SUPRASs of Triton X-100 is negligible . In the same way, SUPRAS of alkyl carboxylates have the ability to extract polar cationic dyes (e.g., basic fuchsin, toluidine blue and methyl green) but not the polar anionic ones . However, solvents made up of ionic amphiphiles formed at high concentrations of acids (i.e., SUPRASs of alkylsulphates, alkylsulphonates, alkylbenzenesulphonates and alkylsulphosuccinates) or salts (i.e., SUPRASs of cetrimide) behave as nonionic amphiphile-based supramolecular solvents and they are not adequate for extraction of ionic solutes. Hydrogen and halogen bonding are extremely effective retention mechanisms for polar compounds. The energy of hydrogen bonds depend on the length of the hydrocarbon chain of the amphiphile (e.g., heptanol > octanol > decanol > dodecanol ) and the temperature set for coacervation. Increasing the temperature causes two opposite effects, the concentration of amphiphile, and hence of binding sites, in the SUPRAS increase and the binding energy of hydrogen bonds decreases , so the operation temperature should be optimized. The energies involved in halogen bonds, however, depends on the nature of the halogen group (Cl < Br < I) . The ability of SUPRASs made up of alkanols and non-ionic polyoxyethylated surfactants to solubilize analytes through the formation of hydrogen bonds, and the capacity of SUPRASs of alkyl carboxylic acids to establish both hydrogen and halogen bonding interactions have been exploited to extract a variety of analytes having hydrogen donor/acceptor and/or halogen groups in their molecular structures. Among the most outstanding applications we can highlight the extraction of pollutants strongly retained in soils and sediments [27, 28] and the extraction of highly polar pharmaceutical residues in biological matrices [29, 30]. The suitability of SUPRAS to extract analytes in a wide range of polarities from a variety of samples makes them especially suitable for application to the determination of multicomponents and the development of generalized sample treatment. Thus, interesting applications have been reported for the determination of multiresidues of sulphonamides in meat  and bisphenols and their derivatives in canned food , and the determination of dyes in many types of foodstuffs . An outstanding property of SUPRASs is their concentration capacity. Extraction of aqueous samples usually involves the formation of the SUPRAS “in situ” by addition of the amphiphile to the sample and setting the experimental conditions in which coacervation occurs. The volume of solvent, and hence the recoveries and actual concentration factors, depends on both the concentration of amphiphile and the environment for coacervation. As a general rule, the volume of SUPRAS generated in the liquid sample linearly depends on the concentration of amphiphile used for coacervation, so, maximal concentration factors will be achieved for the lowest concentration of amphiphile. On the other hand, all the environmental conditions favoring the highest CSUPRAS will give the highest concentration factors. Table 1 shows the values obtained for CSUPRAS from different amphiphiles and environmental conditions [13, 25, 29, 33, 34, 35, 36]. The CSUPRAS values can be determined by total organic carbon analysis [﻿33﻿]. When the surfactant contains chromophore groups, LC-UV can also be used for this purpose . For amphiphiles bearing the same polar group, CSUPRAS diminishes as the length of the hydrocarbon chain of the amphiphile increases. Additionally, an increase in the size of the polar group of alcohol/alkylphenol ethoxylates and oxyethylated fatty acid methyl esters, also results in decreased CSUPRAS values. On the other hand, the concentration of amphiphile in this type of solvents is highly dependent on the temperature and the nature and concentration of the electrolytes present in the coacervation medium [37, 38]. For SUPRASs formed at room temperature, the amphiphile concentration increases with the concentration of coacervation-inducing agent (e.g., HCl for SUPRAS of alkyl sulphates, alkylsulphonates and dialkylsulphosuccinates , and H2O for SUPRAS of alkylcarboxylic acids  and alkanols ). The extraction of organics from liquid samples (usually 10–100 mL) typically involves the production in situ of the SUPRAS by addition of the amphiphile (0.1–2% w/v) to the sample and establishing the coacervation conditions. The SUPRAS spontaneously forms in the sample, which is stirred to favour analyte extraction, and then, centrifuged for SUPRAS separation. The withdrawn SUPRAS extracts that are denser than the respective equilibrium phase is carried out by cooling the tube after centrifugation to increase its viscosity. Then, the supernatant is poured off by decantation. SUPRAS extracts that are less dense than the sample are withdrawn using a microsyringe. Most SUPRASs made up of nonionic surfactants are denser than the equilibrium phases while those produced from ionic amphiphiles, alkyl carboxylic acids and alkanols generally float at the top of the equilibrium solution. The use of centrifuge tubes with narrow necks facilitates withdrawing of SUPRAS that are less dense than solutions when low volumes of solvent (microliters) are used for extraction. These centrifuge tubes are constructed from commercial heavy-duty glass cylindrical centrifuge tubes with round-bottom . Figure 4 shows, as an illustrative example, a scheme of the procedure for the extraction of aqueous environmental samples using SUPRAS made up of inverted hexagonal aggregates of alkyl carboxylic acids. The volume of SUPRAS produced is typically calculated from the cylindrical volume equation πr2h, where r is the radius of the tube and h the height that the solvent fills in the tube. The height is measured using a digital calliper. The solvent volume can be also accurately calculated by weighting. The use of SUPRASs in single-drop microextraction (SDME) , microextraction based on solidification of floating droplet (ME-SFD)  and hollow fibre-liquid phase microextraction (HFLPME)  has been also proposed. Supramolecular solvents enable to extend the applicability of these techniques to areas where the use of nonpolar organic solvents is less effective or not suitable, e.g., when the separation of the analytes is carried out by LC or when the analytes are polar or ionic compounds. SUPRASs consisting of vesicles of alkylcarboxylic acids are especially adequate for use in SDME, ME-SFD and HFLPME owing to their low solubility in water and their ability to form spherical droplets. These properties derive from the strong interactions established between amphiphilic molecules in these SUPRASs through the formation of hydrogen bridges between their head groups, which provide them with a high cohesiveness and stability. SDME, ME-SFD and HFLPME in combination with vesicular SUPRASs have been used to extracts chlorophenols , parabens  and halogenated anilines  in aqueous samples. SUPRASs have been also combined with magnetic nanoparticles in the technique named magnetic dispersive micro solid phase extraction (MD-µ-SPE) [44, 45, 46]. Two modes of operation have been proposed. In the first, extractions are carried out by the formation of the SUPRAS “in situ” and subsequent addition of magnetic nanoparticles that are incorporated into the solvent [44, 45] and in the second, a ferrofluid is prepared from mixing magnetic nanoparticles and a SUPRAS which is added then to the sample . The magnetic supramolecular extract is separated from the aqueous solution with the help of a magnet, and after removing the solution by decantation, the analytes are recovered by solubilising the SUPRAS in a low volume of organic solvent. Thus, SUPRASs made up of Triton X-114 have been used in combination with ferric oxide nanoparticles coated with polysiloxane for the extraction of apolar organic compounds from aqueous samples . SUPRASs of PONPE 7.5-dodecyl sulphate and magnetite modified with diatomaceous earth have been utilized to extract drugs in pharmaceutical solutions and biological fluids . Ferrofluids prepared by mixing vesicular SUPRASs of decanoic acid and magnetite coated with oleic acid have been employed for the extraction of organophosphorus pesticides in aqueous samples and fruit juices . For extraction of organics from solid samples, both in situ and ex situ synthesis of the SUPRAS has been proposed. In situ synthesis involves the extraction of organics in the presence of the equilibrium solution by either adding the SUPRAS/equilibrium mixture to the sample  or forming the SUPRAS in the presence of the sample . Therefore, three phases are always obtained after extraction and separation by centrifugation; the solid residue, the equilibrium solution and the SUPRAS extract. For food samples, proteins flocculated by the amphiphile, separate in a fourth phase that is placed between the SUPRAS and the aqueous solution. As an example, Fig. 5A shows a procedure to extract benzimidazolic fungicides by the in situ generation of a vesicular SUPRAS of decanoic acid . The main advantage of the in situ synthesis approach is the twofold roles that the equilibrium solution can play; humidification of the sample and trapping of polar interferences. However, its use is not recommended for the extraction of polar solutes since they can distribute into the SUPRAS and the equilibrium solution thus decreasing extraction efficiencies. Ex situ synthesis is operationally more convenient because a high volume of SUPRAS can be simultaneously synthesized (typically for treatment of 20–30 samples) and polar analytes are more efficiently extracted. In this way, residues of veterinary medicines belonging to the group of quinolone antibiotics (log Kow = 0.94–1.6) have been extracted from farmed fishes and shellfishes using a SUPRAS consisting of inverted hexagonal aggregates of decanoic acid with recoveries in the intervals 99–102% (Fig. 5b) . Concluding, for polar analytes, ex situ synthesis surpasses the in situ approach in terms of simplicity and sensitivity, while in situ synthesis is the best choice for apolar analytes, because the volumes of SUPRAS required for extraction are lower, and hence, higher preconcentration factors can be achieved. Advantages in terms of selectivity could be also obtained using in situ synthesis. Precision provided by both approaches are similar. There are a number of variables to consider for the optimization of SUPRAS extraction/clean-up methods. The first aspect to consider is the selection of the right SUPRAS taking into account the compatibility with the separation/detection system and the suitability for the analyte and the sample matrix. 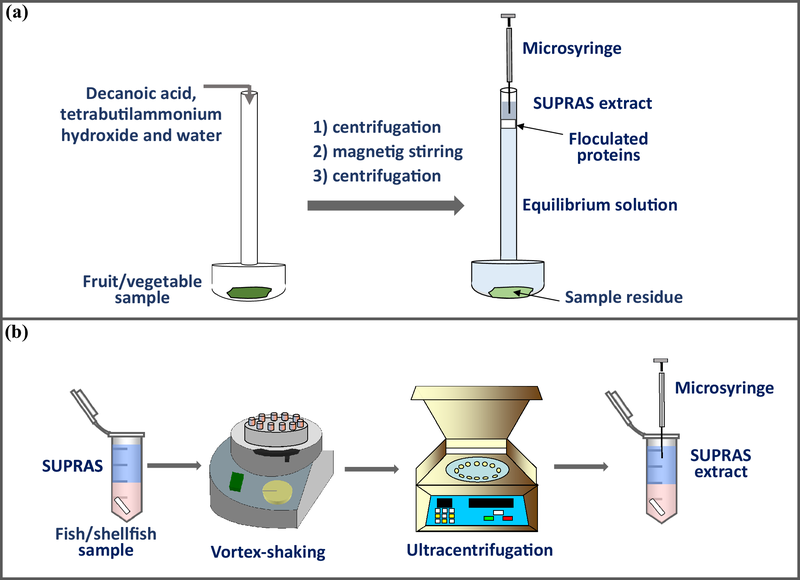 The organics extracted in SUPRAS are usually determined by LC coupled to different detectors, mainly UV–visible , fluorescence , and mass spectrometry . As the SUPRAS extract enters the chromatographic system, the supramolecular aggregates making it up disassemble in the hydro-organic mobile phase producing a high concentration of surfactant monomers that do not influence the chromatographic behavior of analytes. However, supramolecular aggregates slowly disassemble through the chromatographic system as high water content mobile phases are used (e.g., > 40%) thus offering a pseudophase to analytes where they can distribute. The introduction of an additional retention mechanism can sometimes benefit analyte separation, however, is usually detrimental to resolution and the extract has to be diluted with an organic solvent before injection into the chromatograph. The structure and physicochemical properties of the amphiphile are essential for a successful LC separation and detection of the target analytes. The amphiphile signal should not mask those of the analytes and this is especially relevant when using less selective detectors as UV and low purity surfactants or surfactants made up of homologues mixtures. Thus, nonionic surfactants belonging to the Triton X [polyoxyethylene (n) tert-octylphenyl ethers] and polyoxyethylene (n) nonyl phenyl ethers [PONPE] series, which are commercially available as a mixture of homologues and oligomers, are not a good choice for the separation/detection of polar or medium-polar compounds because of their high background absorbance and fluorescence signals and the great probability of coelution. The use of non-aromatic ionic or zwitterionic surfactants, which feature low retention times and do not absorb above 210 nm, avoids this problem. As a general rule, the surfactant is directly addressed to waste after chromatographic separation (i.e., only sample components are detected) when mass spectrometric detection is the choice. In this way, ion-source contamination and/or loss of the ionization efficiency and detector sensitivity are avoided. SUPRAS formation conditions should be also compatible with the solute and the application for what is aimed. For example, highly salty environments could be beneficial for analysis of marine waters or effluents coming from the textile industry, where a high ionic strength is expected. For the same reason, high temperature-induced SUPRAS must not be employed for thermolabile compounds and counterions or ionic surfactants can improve the co-extraction of ionic analytes by ion-pairing. In this way, Orange II (anionic dye) was extracted from food by a SUPRAS of mixed micelles of a non-ionic surfactant (Triton X-100) and a cationic surfactant (cetyltrimethyl ammonium bromide, CTAB), the latter acting as ion pairing reagent . The presence of highly acidic conditions can also enhance the recoveries by disrupting matrix–analyte interactions. Regarding the equilibrium between the SUPRAS and the bulk solution, while for standard analytical methodologies the re-equilibration of a small amount of amphiphile with the aqueous sample is not a disadvantage (at the cac level) this must be prevented for the use of single-drop microextraction (SDME) and for water remediation. These losses can affect significantly the tiny amount of extracting phase in SDME or can contaminate the purified water sample with residues. For this aim, highly kinetically stable vesicular SUPRAS have been preferred . Enough SUPRAS volume must be added to ensure the dispersion and homogenous extraction of solid samples. Due to the low SUPRAS volume typically used, usually in the microliter range, low sample sizes are employed (100–500 mg) which can be a handicap for subsample representativity. If subsamples are not homogenous enough, this issue must be solved before extraction. Thus, wheat grains (25 g aliquots) were ground with a mixer mill down to particle sizes below 50 µm, which permitted to get representative 300 mg subsamples . As far as SUPRAS formation conditions are compatible (or even beneficial) with the target analyte(s)/sample matrix, we can tune the SUPRAS composition to enhance the recoveries/clean-up properties. As explained in the previous sections, the SUPRAS extraction interactions are multiple and located at different regions of the nano- and micro-aggregates (e.g., dispersion at the hydrophobic tails of the amphiphiles; hydrogen bonds, ionic and polar from the amphiphile functional groups, which can be located at outer surfaces or inner aqueous pores, ionic with counterions, etc.). In general, more polar amphiphiles will result in more polar SUPRAS, which in turn increases extraction efficiency for polar organics. Thus, in long-chain alkanol-based SUPRAS the water content in the supramolecular aggregates, and consequently, polarity, increased linearly with the number of atoms of the alkyl chain length from C7 to C14 . SUPRAS polarity can be also influenced by the concentration or rate of the coacervation-inducing agent. Thus, dehydration of ionic/polar groups makes supramolecular aggregates more compact and favors extraction of polar solutes . Recovery of solutes can be also influenced by the coacervation-inducing agent. The extraction efficiency of aromatic compounds was increased in vesicular SUPRAS by promoting pi–cation interactions with the coaervating agent (tetrabutylammonium ions). The increase of the coacervation-inducing agent concentrations (in excess with respect to the amount needed for SUPRAS formation) improved the extraction efficiency of bisphenols and parabens [13, 42]. SUPRAS have been tailored to act simultaneously as extractant and as a clean-up phase due to the restricted access properties known to effectively prevent co-extraction of common high molecular weight interferents . SUPRAS composition and aggregate and “pore” sizes or micro and nano-structure can be tailored by selecting the amphiphile and self-assembly conditions to remove interferents as much as possible and to develop fast methods without the need of additional clean-up steps. This behavior has been investigated to remove macromolecules with SUPRAS made up of long-chain alcohols in mixtures of THF and water. These SUPRAS have proven to exclude by chemical and physical mechanisms urine proteins when analyzing bisphenol A in urine , humic acids in the analysis of endocrine disruptors in sediments  or proteins and carbohydrates for the analysis of fusarium toxins in cereals , among other applications. The phase volumes ratio is together with the extraction efficiency and the selectivity key factor that should be examined to maximize sensitivity. The SUPRAS composition and structure (tuned by the selection of the amphiphile and the self-assembly conditions) will determine the SUPRAS phase volume. As explained in previous sections, this volume usually increases linearly with the amount of amphiphile and can be also affected by the coacervation-inducing agent, e.g., an increase in temperature or salt produce more compact SUPRAS phases with less total volume, what is beneficial as far as the extraction efficiency is high enough and the phase is not too viscous for operational purposes. The proposal of equations to predict SUPRAS volume under a range of formation conditions is very useful to calculate phase volume ratios and decide a priori those conditions giving enough sensitivity for further study [13, 52]. Other typical variables influencing the SUPRAS extraction/clean-up method are pH, temperature and ionic strength, since they can vary among real samples and should be studied to assess the robustness. These variables can also affect SUPRAS formation and hence composition and phase volume ratios. The pH needs to be adjusted when the analyte contains ionizable groups so that its aqueous solubility is minimized with the presence of the neutral form. Thus, extraction recoveries for phenolic compounds were enhanced at pH below 6 by keeping their unionized forms and promoting hydrophobic interactions with a SUPRAS of the non-ionic surfactant Tergitol 15-S-7 . The addition of salts (commonly NaCl and Na2SO4) can influence SUPRAS formation too (e.g., by decreasing the cloud point temperature as described in previous sections) and can facilitate phase separation and affect the extraction efficiency because of salting-in and salting-out effects. The effect of chloride salt of various cations (Na+, Mg2+ and Al3+) i.e., NaCl, MgCl2, and AlCl3 was tested for the extraction efficiency of phenolic compounds with a mixed micelles-based SUPRAS (tetrabutylammonium bromide + SDS) . The salt acted as coacervation-inducing agent and affected both coacervation and solutes extraction. Best results were obtained with AlCl3. Temperature is especially relevant in temperature-induced SUPRAS but also when very low extractant phase volumes are used. Recoveries of nitrophenols improved from 20 to 30 °C because of the increase in mass transfer when using vesicular SUPRAS . Extraction with SUPRAS usually involves a stirring step for accelerating the extraction by increasing the mass transfer among the sample and the formation of tiny SUPRAS droplets within the solution. Equilibrium is reached fast. Few minutes are enough for liquid samples (typically 5–10 min) by vortex shaking or magnetic stirring while for solid samples a bit longer times are required for complete dispersion of the matrix with vigorous vortex. The extraction step is followed by centrifugation to accelerate phase separation (typically 2000–4000 rpm). Ultracentrifugation (10,000–15,000 rpm) is recommended for solid samples and complex biological fluids or food to ensure complete separation of matrix components (proteins, polysaccharides, etc.) and to prevent coagulation with the SUPRAS phase. Calibration is another aspect to be examined when performing SUPRAS methods. The direct injection of the SUPRAS in LC is usually limited to low volumes (2–5 µL and 10–20 µL with LC flow rates of 0.2–0.3 and 1–1.5 mL/min, respectively). In this way, we ensure disruption of the aggregates with the organic mobile phase and prevent time shifts or poor chromatographic peak shape with respect to conventional solvents. Nevertheless, even with low injection volumes, SUPRAS can enhance/suppress ionization, especially under soft MS–ESI conditions and in this case SUPRAS-based calibration is needed. The use of low SUPRAS volume for extraction sometimes results in non-quantitative recoveries and, like in other microextraction methods, internal calibration (calibration standards undergo the whole extraction procedure) is recommended to compensate and correct concentration levels. When analyzing water samples, distilled water can be used for internal calibration. For complex matrices, such as food, matrix effects can be compensated by internal matrix-matched calibration with a representative blank sample. Anyway, in most cases, the selectivity and compatibility of the SUPRAS with the separation/detection system is enough to perform external organic solvent-based calibration and quantitative recoveries are obtained with low SUPRAS volume due to their great extraction efficiency. Finally, typical analytical parameters must be investigated, i.e., matrix effects, reproducibility, accuracy, stability, etc. Validation with real matrices and/or reference materials should not be overlooked to ensure good performance at real working conditions. Supramolecular solvents have proved to be excellent extraction materials offering multiple interactions for extraction, restricted-access properties for the exclusion of macromolecules (interferences), easy synthesis at everyone reach and green properties. However, the implementation of these alternative sample treatment methods to laboratories may be still limited by the scarce information about practical aspects in the optimization and operability of SUPRAS. These aspects substantially differ from those involved in a liquid–liquid separation step with conventional organic solvents. SUPRAS are environmental responsive solvents and their composition, micro and nano-structure and extraction interactions can be tuned and selected over a wide range of possibilities. To exploit this versatility, more research is needed to design, elucidate and predict SUPRAS properties for tailored-approaches. Advances in characterization techniques (e.g., cryogenic electron microscopy to preserve the SUPRAS structure during observation) and in-depth studies regarding SUPRAS formation and composition under variable experimental conditions could help to achieve this objective. Furthermore, the design of SUPRAS with functional properties (such as the emerging use of magnetic SUPRAS) or new microextraction formats are aspects to be further exploited and investigated to extend their applicability. Finally, up to now, SUPRAS are mainly limited to LC separations. 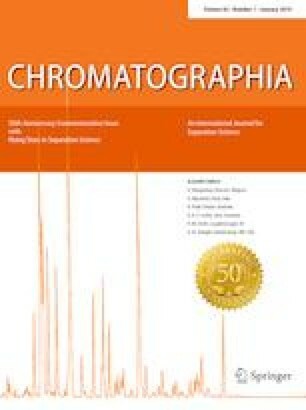 In this way, the development of volatile SUPRAS or easily removable surfactants by suitable clean-up techniques is also desirable to ensure their applicability to other analysis techniques, such as gas chromatography or immunoassays. Authors gratefully acknowledge financial support from Spanish Ministry of Science, Innovation and Universities (Project CTQ2017-83823R). A. Ballesteros-Gómez acknowledges the funding from Spanish Ministry of Science, Innovation and Universities for a Ramón y Cajal contract (RYC-2015-18482). A. Ballesteros-Gómez declares that she has no conflict of interest. L. Lunar declares that she has no conflict of interest. M.D. Sicilia declares that she has no conflict of interest. S. Rubio declares that she has no conflict of interest.